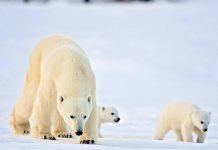 Polar bears and penguins live on the opposite poles but under similar environmental conditions. It explains a lot about the evolutionary developments of both species. Polar bears and penguins chemistry doesn’t match or probably should never be for there is a predatory-prey relationship lie between the two. 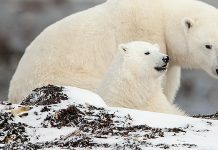 However dissimilar they may appear to be, polar bears and penguins share many similar behavior traits. For instance, both are aquatic species and are exceptional swimmers. In fact penguins are one of the world’s fastest swimmers. 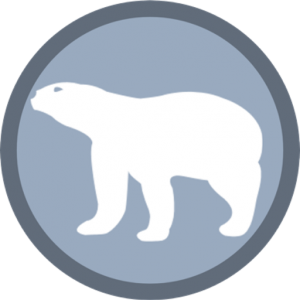 What do Polar Bears and Penguins have in Common? Penguins live in the South Pole while polar bears live in the North Polar. They both live at the opposite ends of the pole. Thus there is no chance that polar bears meet penguins. 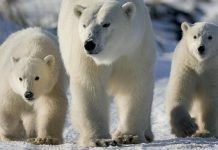 In order to have interactions between the two either polar bear or penguin must be a great traveler. Ice bears are known to migrate during the ice-free winter but they never get to the Southern Hemisphere. 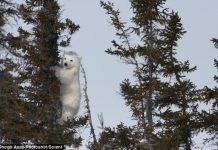 Polar bear’s white coat blends with the snowy background—providing a perfect camouflage against any possible threats. Similarly penguin’s camouflage is due to their countershading appearance making it difficult for marine predators to recognize them from below. 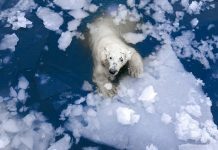 Polar bears are insulated by their dense furs which are also oily so that water slips away. 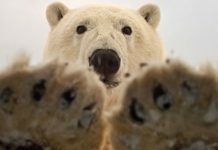 The polar bear’s hairs are water resistant and thus keep the bear warm in the icy cold water. Penguins are insulated by a thick layer of feathers that keep the bird warm at all times. Penguins have got the ability to reach the speed of about 6 to 12 km/h (3.7 to 7.5 mph) underwater which is nearly the swimming speed of polar bears. Ice bears typically swim at a speed of 10 km/h. Baby penguins rarely dive just like baby polar bears. Polar bear cubs mount on the mother’s back during swimming. While polar bears are shallow divers rarely going beyond 5 or 6 feet underwater penguins can reach the depths of about 565 m (1,854 ft). Ice bears can remain submerged for as long as 2 – 3 minutes but penguins can stay underwater for 10 – 15 minutes. Penguins are highly social animals in that they live in colonies consisting of thousands of birds each. Polar bears are lone walkers. They prefer to live a solitary lifestyle.